Acquired: Signed as a free agent on May 11, 2017. 2018: O’Brien appeared in all 18 games and is the team’s place holder. He finished 4-5 (80.0%) passing for 44 yards and 1 interception. He also had one carry for one yard. 2017: O’Brien appeared in all 18 regular season games and is the team’s place holder. O’Brien appeared in the West Semi-Final and West Final. 2016: (Ottawa) O’Brien appeared in three games where he passed for 141 yards. 2015: (Ottawa) Played in three games and accumulated 98 passing yards. 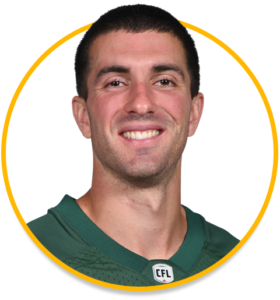 2014: (Ottawa) Played in nine games and threw for 421 yards and two touchdowns. College: O’Brien spent time at Catawba, Wisconsin, and Maryland where he threw for 7,099 yards and 47 touchdowns in 39 games played.